Blessed be the God and Father of our Lord Jesus Christ, who has blessed us with every spiritual blessing in the heavenlies in Christ Jesus (Eph. 1:3). In the heat of all things political and especially, presidential, I thought I would tell a joke about the president that will make us all laugh. Well, I hope so. The startled assassin jumped, dropped his gun, and was captured. Fear is no joke. It is a powerful motivator, but it can also paralyze. Joshua had been trained by Moses. He was privy to all leadership strategizing, decisions, and implementation. But when Moses was handing over the responsibility of leading Israel, I’m sure Joshua was excited and frightened all at once. Yet, he took on the responsibility and led the people, beginning with a most fearsome act, stepping into a flood-stage river to cross the Jordan, then facing the mighty city of Jericho. Let us pray. Almighty, loving, and merciful God, your Son’s glory was revealed through the humility of doing your will. Keep us from the temptation to do our own wills on earth instead of your heavenly will. Through the power of your Spirit, help us to first seek your kingdom and your righteousness so that we may find life in you, and find it in abundance; through Jesus Christ, our Lord. Amen. How did Joshua do it? Was there a self-help section at the local Transjordanian bookstore? Did he have a life coach that the Old Testament never mentioned? Perhaps he practiced the power of positive thinking so that by summoning only good thoughts, good things came his way. Of course, none of these things were the case. One is as absurd as the other. Nonetheless, Joshua did do something. It was critical, and I think we find the clue in what Joshua said to those tribes who wanted to stay on the eastern side of the Jordan. They had promised to fight their brothers’ enemies in the promised land before returning to the Transjordan. And they did just that, with evidently great enough success for Joshua to say these all-important words that hold a clue to his secret. But before they crossed back over the Jordan, Joshua praised the eastern tribes them for their faithfulness. I am not sure, but I don’t think the rest of Israel ever heard such words of praise. Joshua praised the tribes of Gad and Reuben, and the half-tribe of Manasseh, for keeping the commandments that they had received from Moses, as well as for obeying the directives of Joshua. He praised them for having their brothers’ backs in battle, for not turning in the fright of war. He praised them for keeping the charge of the Lord—for keeping their word to rid the promised land of heathen before returning to their own promised lands—promised that is, by the word of Moses. And that, I think is the key to Joshua’s life, and to the faithfulness of the eastern tribes. It is why the western tribes never received such praise. In fact, it is the same exhortation that Martin Luther gives us in his catechisms. I like to think of it as Luther’s version of the most important commandment. Are you ready for it? Here it is: “We should fear, love, and trust God above all things.” That’s it. Fear God. Love God. Trust God. Above all things. Jesus puts a fine point on this in Matthew’s and Luke’s Gospels. “If anyone comes to me and does not hate his own father and mother and wife and children and brothers and sisters, yes, and even his own life, he cannot be my disciple.” These are hard words but resonate with the greatest commandment, whether Moses’ version, or Joshua’s, or Luther’s. Love God above all things—even family. Even your own life. With advice like that, you could possess the land. You could pick up your cross and follow Christ. You could be his disciple. All it takes is renouncing all that you have. And all it takes to renounce everything is to put God first—above all things. Some of you have been asked to do just that, to put God before family. And you have. The Lord bless you and keep your families. Just here I would like to tell you a personal story from a church I once served. A mother and father were very concerned about their adult children, and about their grandchildren. They were not in church, were not learning about Jesus, and these members of my congregation were so concerned that they came to me, asking for help. They told me that they hadn’t raised their children this way. Sound familiar? So, I did the hard thing because I wanted their children and grandchildren to know the Lord and be faithful. I told this struggling mother and father, grandmother and grandfather, that they had in fact raised their children to do precisely what they were doing. They had raised them to not go to church. They were stunned. Shocked. They were angry—as I expected them to be. So, I assured them that I was trying to help and that if they let me, I thought we could see their kids in church again. They calmed down enough to listen, so I continued. I asked why I didn’t see them at the Christmas Eve service. They replied it was because the grandchildren were visiting for the holidays, that if they came to church they would miss out on the time with family. Christmas Eve was their family time. I quickly said that if they would come to church every Sunday that their children came to visit, that I would pray for their family’s spiritual healing. I further declared, that while I could promise nothing, and that it may take some time, because they had indeed basically raised their children right, I thought God would honor their sacrifice and heal their family. It did take time. And it was not easy for them or for their kids. But the next time the children and grandchildren came to visit for a long weekend, my friends invited them to come to church with them. They made the lame excuse, as I recall, that they hadn’t brought any church clothes. So, they came to church, just the two of them. And the kids drove home, upset with mom and dad. I don’t remember if it was the next visit or the one after that, but they brought so-called church clothes with them, and came to worship as a three-generation family. And when they went home to their different states, they found new church families there. Here’s another way that Jesus said this: “Seek first the kingdom of God and his righteousness.” Then all these things that we are so anxious about will be supplied by the hand of God. If we feared God above all things, we would be more concerned about what he wants than what we want. If we loved God above all things, we would come to know him as the most loving Father, who cares for his children, knows what they need, and is anxious to bless them. If we trusted God above all things, we would not fear the hour of judgment that is coming. We would be content to worship him and give him all glory, letting the things of this life settle where God wills. Consider today and throughout the week what God’s will is for your life, and for your family. Pray that it may be done on earth, even as his will is done in heaven. Then seek to follow him with fear, love, and trust. 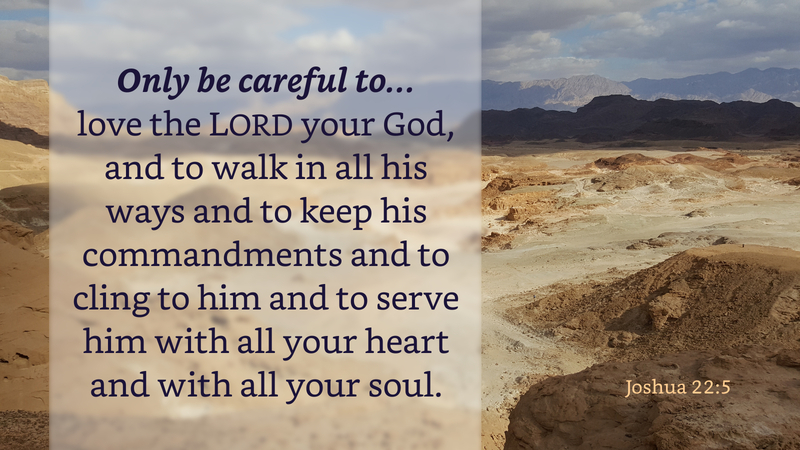 “Only be very careful to…to love the LORD your God, and to walk in all his ways and to …cling to him and to serve him with all your heart and with all your soul.” Amen.